I love donuts. I mean, if you go onto my recipe page you will see I have a section just for donuts! I definitely enjoy the yeast donuts that are fried, however sometimes you just don’t have all day to make donuts. Sometimes you want a chocolate donut, within the hour. Well, you’ve come to the right place. Because I feel the same way. So I made donuts, and within the hour they were ready to eat (okay, some were eaten). I hope you enjoy them as much as my kids did (yes, me too). For the donuts, mix dry ingredients in bowl. Beat in the eggs, milk, vanilla and butter. Beat until well blended. Spray donut pan with cooking spray. Fill each donut cup about 3/4 full (I use a ziploc with the corner snipped to do this neatly). Fills about 8-10 donuts. Bake donuts in 325 degree oven for about 11-14 minutes. Allow to cool slightly, remove from pan. While cooling, make chocolate glaze. In small saucepan on medium low heat, mix together the cream, milk, butter, vanilla and corn syrup. When butter is completely melted, turn heat to low and add in the chocolate. Dip each donut into the glaze, allow to cool. (optional- sprinkle with toppings). Allow chocolate to set (about 15 minutes). Enjoy! Can I order a dozen or two? I prefer baked donuts and these look heavenly! Yes, please. I will be looking for my package of donuts in the mail:-) Heavy on the glaze please! These look delish!!! Those look so GOOD! Love the colored sprinkles. Oh man you are killing me over here. These look sooo good! Wish I had one for breakfast! This confirms it…I NEED a donut pan soon! This look amazing! 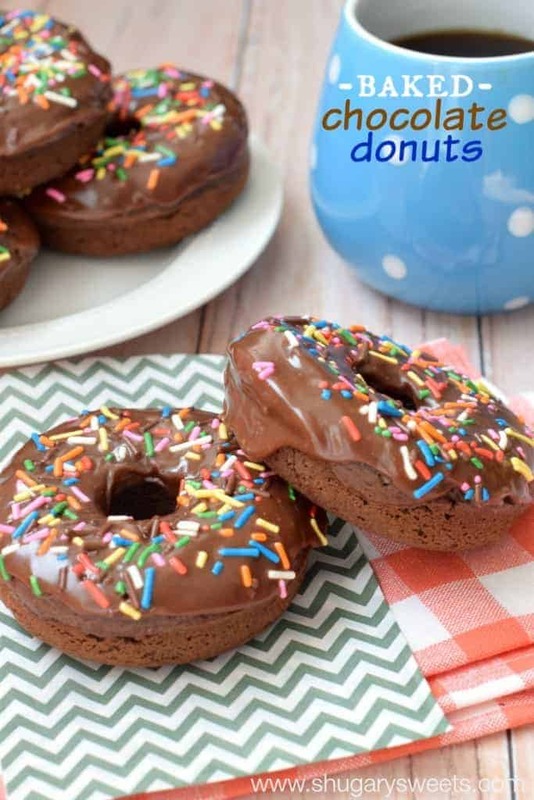 They look amazing I must admit donuts with sprinkles are my favorite I can not wait to try this recipe! These look just like those yummy chocolate cake donuts you can get at the gas station!! 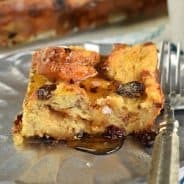 I am saving this recipe and as soon as I get a donut pan I will be trying it! Totally delicious looking! Thanks for the recipe! today at Frugalicious Me! Thanks for sharing!!! I can’t make them! Oh how yummy these look! I don’t have a donut pan yet, but maybe I should get one! Wow, these look good! I love the fact that they’re baked. Bookmarked to try! AWESOME! My favorite donut is the chocolate cake donuts fr DD’s and these look just like them! And they’re baked! yay! I’m featuring these this weekend because they’re just begging me to make them. I just got some donut pans and can’t wait to try your recipe! My oldest has a severe peanut allergy so finding safe donuts is almost impossible. I’ll have some of these ready for him when he gets back from Scout camp today! You’ve made a 12 year old’s day! Pinned these. They look SO yummy! And I love baked donuts! Hopping over from Something Swanky pinterest blog hop! I love finding new blogs. I’m your newest follower on here – I can’t resist a good food, (especially treats!) blog and I’m following your boards on pinterest. I even saw you have repinned one my my recipes! 🙂 Hope you’ll stop by and follow me too at purplestpecalin.blogspot.com! These look like the perfect recipe for my doughnut pan! My kids will love them! Those look delicious. Now I need a doughnut pan! I’ve been looking for a good chocolate dounut recipe for my pan. I’m pinning this! Thank you! 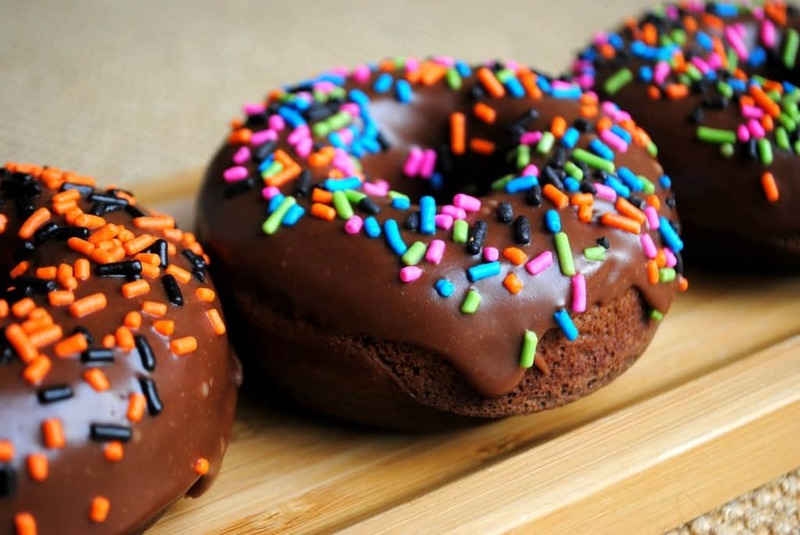 I LOVE chocolate donuts! Now I need to buy a donut pan. I LOVE LOVE LOVE doughnuts too. These look AH-mazing!!!! Thanks for sharing! These look seriously good! 🙂 Yum! Yummmy..This is so awesome..love it..I found you over at Wow me Wed and had to stop in..Officially following ya with smiles..Great blog you have here with tons of creativity..Hope u can visit me sometime via http://theartsygirlconnection.blogspot.com TY. PS: Project Pink Blog Link Party is this weekend the 30th, would love for you to join over 50+ bloggers go PINK for breast cancer..You can find out more here..Wishing u a great week.. I need a donut pan – I really want to make these! These look so yummy! Thanks for linking up! I’m featuring them on the blog tomorrow! I baked these the other night with my kids and they were a HIT!! 🙂 Two thumbs up all around. These look amazing! I’m picky with donuts – chocolate cake and blueberry cake donuts are the only kind I really like. I bet these would be amazing with a pumpkiny glaze on top! Well… I bought myself a donut pan and made these great doughnuts…They were great, notice I said “were” because they are all gone! Thank you for the recipe. @ Scsanders82- So glad you enjoyed them! The donuts are the best! I shared them with the boys, and with people at work, and they all were blown away. Thanks for sharing such an awesome recipe with us! 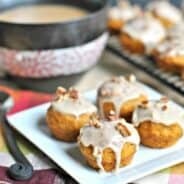 I have been making doughnuts with my doughnut pan for awhile and I have tried several recipes. All have tasted pretty good, but they all just seem to be cupcakes in the shape of doughnuts. So obivioiulsy, they taste good, but not really like a doughnut. So what was your consensus on these? Were they a cupcake texture or a dense real chocolate cake donut texture? 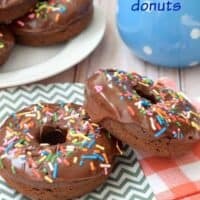 I’m trying to find a chocolate recipe that is a true cake donut recipe not the light fluffy kind. I’m making these for a party this weekend, they look great! Can they be made a day ahead?! I’m so glad you enjoyed them! I love that you used coffee creamer, I’ve done that too! YUM. I’ve heard that you can replace eggs with bananas or applesauce in a pinch. You could try that?! This will be the first recipe I’ll try and I am excited to do so. What type or flour should I use for this? 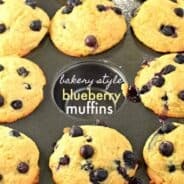 Cake Flour or All-Purpose Flour? Use all purpose flour! ENJOY! I will try your recipe tomorrow and will let you know how it turns out. Thank you for sharing your wonderful recipes and ideas to so many. I tried your recipe today and it did not disappoint. Its really a good base recipe. Cakey but moist. Thank you!!! I made these today and they were absolutely disgusting. It was a waste of ingredients and after taking one bite of the hard little rocks I threw the rest out. Stick with dunkin donuts and don’t waste your time! I’m sorry you didn’t enjoy the chocolate donuts. I wonder if maybe there was a mistake in reading the ingredients? I’ve been making these for a couple years (as have many others) with no problems! I finally made these, Aimee, and I can’t believe how easy AND tasty they are! Great recipe. I posted them tonight! Have you ever used the mini-donut pan for any of your donuts? I can’t wait to try some of you recipes! These donuts was delish.Only change I made was used a mini muffin pan.I don’t have a donut pan(on the shopping list). But tasted amazing.Mini donut muffins.I still put them in the glaze and sprinkles.Kids loved them. Would this recipe work in a donut maker? I have one that I lost the instructions for. I would love to try this recipe out in it!! Looks amazing!!! My kids loved these! We were able to get about 18 donuts out of your recipe. So good! We love the Vanilla Bean donuts as well. So glad to hear! Thanks for stopping by and letting me know! I just want to say that this morning I had a donut craving so I made the vanilla bean donuts with this chocolate glaze. Every time I make one of your donut recipes they come out perfect. The glaze was amazing and set on the donuts perfectly. These donuts looked perfect, i was so inspired, obsessed to be exact, to make even when i don’t have donut pan myself. Took a little imagination and was finally able to try this recipe. sweet mother of god these are good! I just made them, (somewhat to the recipe) and they are AMAZING. All I did different was leave out the baking powder ( I didn’t have any) and substituted the milk with chocolate soy milk ( I’m not lactose intolerant I just like it better) and I’m in love! P.S. I used a Wilton doughnut pan and it made exactly 12 doughnuts. I’ve had this recipe bookmarked for awhile, but just got around to trying them today. OH MY! They are so delicious! I don’t normally have cream on hand so I used a little more milk in the icing instead & it came out perfect. I think they’d be great with a simple milk/powdered sugar glaze too. Thank you for the new addition to my recipe binder!